It’s getting colder and the sky’s are getting gray. Sunlight seems in short demand and you complexion is getting pale and losing it’s summer vibrancy. Look like you have that perfect tan with your skin glowing and not having to worry about the sun damage caused by extensive exposure.Achieve that glow in minutes with PRASAD’s Sunless Tanning Solution and the expertly trained professionals to give you the look you want. PRASAD Sunless Tanning Solution is a formulated solution, that when sprayed on a tanner’s skin, can give the tanner a “just off the beach” look. 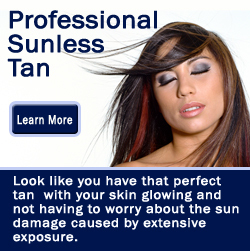 Three different types of bronzers are used in Sunless Solutions. First, there is the instantly visible cosmetic bronzer. Cosmetic bronzer gives the “just off the beach” look, but will wash away. (For best results, cosmetic bronzers should remain on the skin at least 8 hours). Bronzer type two is DHA. The DHA bronzer initially has no visible effect, but begins to react with the skin in 2-4 hours and eventually replaces the cosmetic bronzer as it washes away with bathing. DHA is an acronym for Dihydroxyacetone. DHA is an ingredient derived from sugar cane and beets, which reacts with the amino acids in the skin to create the darkening reaction or tan. Finally, Eyrthulose is used as a slow-reacting bronzer, very similar to DHA, Eyrthulose enhances the clients color and extends the life of the spray tan.